This guide will educate the reader on techniques for using PT-4 male DC power leads for wiring analog CCTV cameras and HD security cameras (HD-TVI, AHD, HD-SDI, HD-CVI). The following topics will be discussed. What are PT-4 DC power leads? PT-4 power leads (also known as pigtail leads) are cables that have a male 2.1mm power plug on one end and raw power cable on the other (typically 18 gauge). PT-4 cable leads are typically used for wiring video over coax cable security camera systems using RG59 Siamese cable spools or pre-made Siamese camera cables. They assist in connecting low voltage power to cameras and power supplies in different situations that are discussed in this article. Although they are typically referred to as "DC power leads", in reality they can be used for 24VAC and other low voltage power sources as well. Dual voltage cameras and 24VAC cameras typically have power terminals instead of a 2.1mm plug type input. 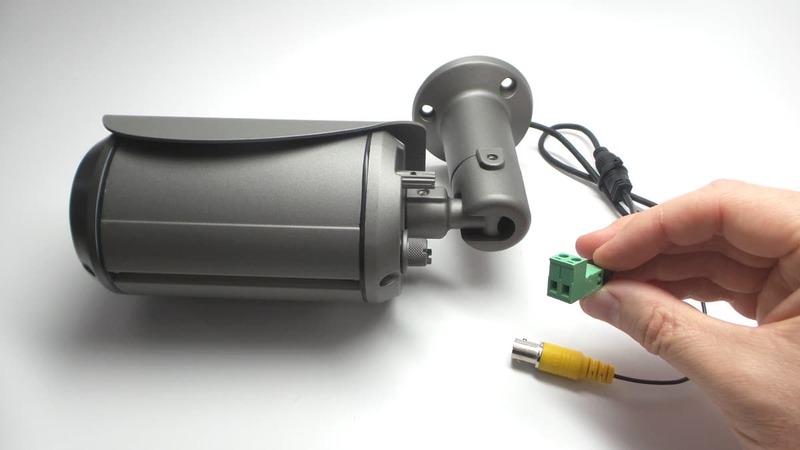 In order to connect these types of camera to pre-made Siamese cables (which already have a female 2.1mm plug on the camera end), installers can attach a PT-4 to the camera's power terminal block. This allows the premade cable to connect to the camera's power input simply. Another use for PT-4 power leads is when using spools of RG59 Siamese cable with individual power transformers. On the right side of the above diagram, you can see how a PT-4 is attached to the 18/2 power cable of RG59 Siamese cable so that it can be attached to an individual power transformer. This can be used for 5V, 12V, 24V and and other low voltage transformer. This article was written by Mike Haldas, co-founder and managing partner of CCTV Camera Pros. If you have any questions about how to wire security camera systems, please email me at mike@cctvcamerapros.net.